Scottish Water’s treatment plant for the Stirling area requires increased treatment in the summer months, mainly due to population growth from visitors and tourists and increased productivity of local businesses. 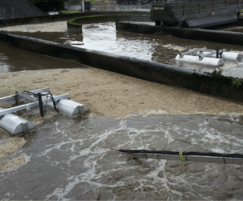 Aquasystems International was contacted by Scottish Water in 2017 to enquire about installing tempory floating aerators, and a number of the 15kW Aqua Turbo® AER-AS units were hired for the summer of that year. Planning by Scottish Water allowed for allocated capital to purchase four Aqua Turbo® AER-SL units which are ideal for producing flow but also inducing oxygen into the waste water. 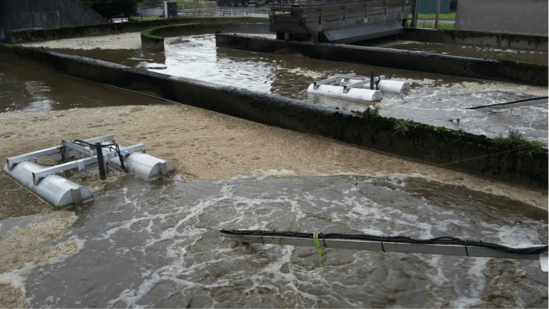 The 15kW aspirators were installed in each lane of the oxidation ditches on the Stirling STW treatment plant in the autumn of 2018 and have worked efficiently since. A spokesman for Scottish Water complimented Aquasystems International NV for their fine workmanship and the ease of installation and commissioning. The works meet the increased demands during the peak summer periods and have also allowed for ongoing maintenance of the existing rotors during the winter months. The treatment works has met its consent due to the additional aeration capacity provided by Aquasystems International NV.